Triple-negative breast cancer’s propensity to spread makes it one of the most aggressive, difficult-to-treat forms of the disease. There are currently no existing therapies for this cancer, which commonly metastasizes to the brain, but Terricka Williams, an Honors College Path student and sophomore biology major from Maumelle, Arkansas, is hoping to change that: She is researching what makes this cancer so devastating, as well as potential ways to fight it. 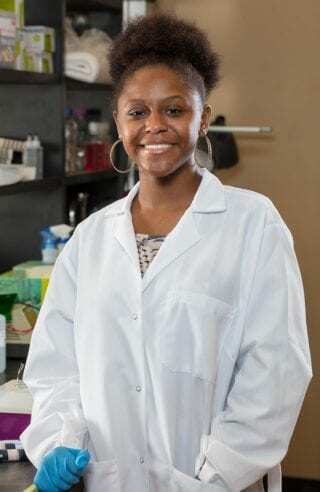 Terricka is working closely with her mentor, biology professor Dr. Tameka Jennings, to determine the role a particular protein plays in contributing to both metastasis and cancer cachexia, or the loss of at least 5% of an individual’s body mass due to disease. Though Terricka is relatively new to Dr. Jenning’s lab, she certainly has the requisite confidence of a premed researcher: “We are going to cure triple negative breast cancer,” she declares. We sat down with Terricka to discuss this confidence, her research and the path that led her to both. 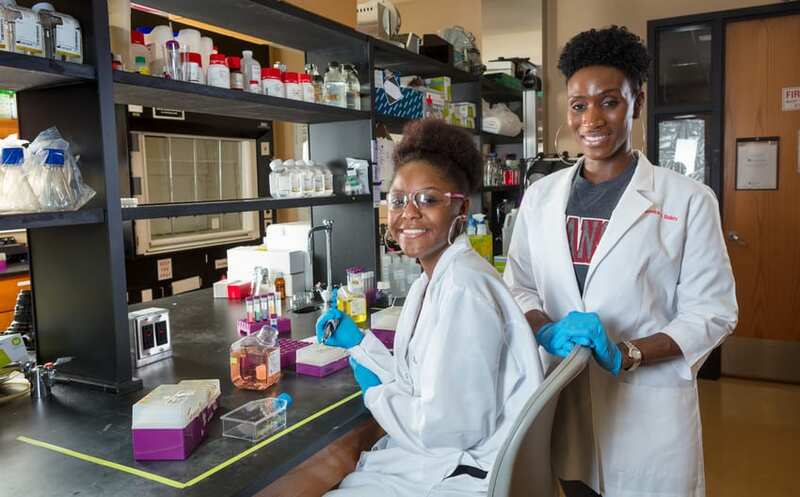 Terricka and her mentor, Dr. Tameka Jennings, take a break from pipetting to smile at the camera.